Seattle MESA organized an educational field trip for 50 Rainier Beach students who toured around the University of Washington Campus and had the opportunity to learn about various career fields in STEM (Science, Technology, Engineering, and Mathematics). These students are part of the Summer Math Scholars program in conjunction with Freedom Schools at Rainier Beach High School. The students switched to different sessions throughout the day. They started off with University of Washington’s iSchool, where Academic Advisor, Tori Gottlieb, gave a presentation to the students. They learned about the Informatics program, the study of information and its use by people and organizations. The students discovered career paths, academic requirements, and explored the connection of information and technology to solve problems within communities. Aside from the presentation, the students participated in a prototyping activity. The students worked in teams to design clocks based on the different consumer needs. The students then switched topics to: Earth and Space Sciences. A panel of Space ambassadors shared their experiences as being part of the major and being a UW student. Students learned about the variety of courses, level of rigorous of classes, the professor’s engagement during class and the guidance of academic advisors. Students were actively asking questions and wondered if there was any help for homework. The UW students shared their favorite place to get help from which is the IC (Instructional Center), available for minorities on campus. A 10th grade student then asked if there was any kind of involvement for minorities on campus, Jess, a UW Senior, responded, the Ethnic Cultural Center provides space for various organizations to build a community and a support system. 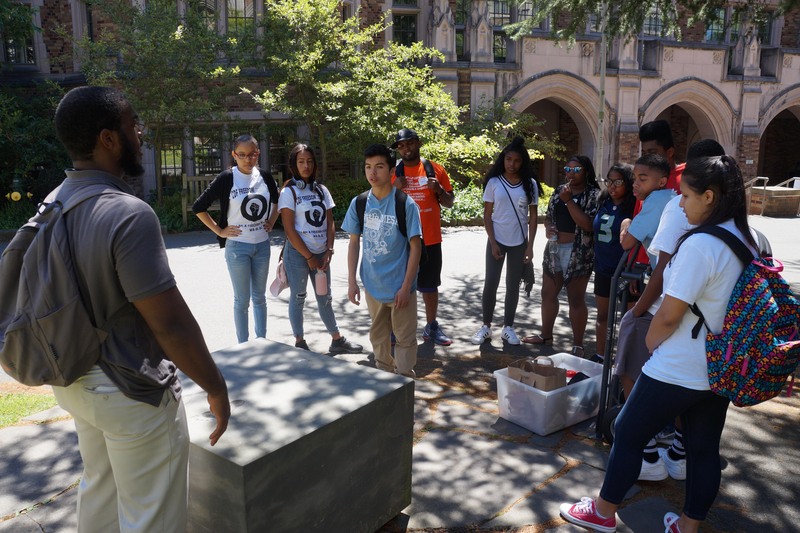 Lastly, high school students were lead on a “Radical Tour” around the UW campus. They observed various statues that had a relationship to social justice causes. For example, the “Blocked Out” sculpture, which is a slave auction block that honors those who are oppressed. As the students were standing on Red Square, they discovered that years ago it was purposely made with bricks to stop people from protesting. The students saw the giant book called, Bhutan that is located in the Suzzallo library, in which every month a page is turned. Students enjoyed viewing the “Harry Potter” room also known as the Suzzallo Reading Room. Some students observed the architecture of the celling, while others grabbed a book and sat down to have a taste of what it’s like being a college student studying in the Suzzallo library. ⟵Congratulations To Our Scholarship Winners!